This week, we start an examination into cervical disc herniation, which compresses nerves of the neck, causing pain and other symptoms. 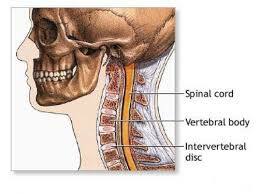 Disc Degeneration - Chemical changes associated with aging cause intervertebral discs to weaken, but without a herniation. This is part of the aging process discussed above, and it can cause the disc to dry out, making it less able to absorb the shock from your movements. It can also become thinner in this stage. Prolapse - The form or position of the disc changes with some slight impingement into the spinal canal or spinal nerves. This stage is also called a bulging disc or protruding disc. Extrusion - The gel-like nucleus pulposus (inner part of the intervertebral disc) breaks through the tire-like wall (annulus fibrosus) but remains within the disc. Sequestration - The nucleus pulposus breaks through the annulus fibrosus and can move outside the intervertebral disc and into the spinal canal. Next time, we will explore the risk factors for Cervical Herniated Disc and non-surgical treatments. If you are experiencing neck pain, don’t wait for your family physician; visit Excel Rehabilitation Services on Burnside Ave. in Gonzales, Louisiana. You will receive one-on-one care from an experienced physical therapist!